I'm already itching for Halloween! It can't be helped, I have an obsession! As I was browsing Etsy I found two of my favorite things all in one awesome product. Vintage and Hallows Eve! 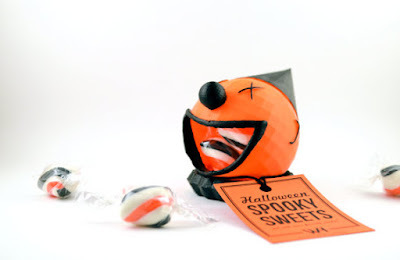 Witch House Design makes some of the most adorable and horrifying vintage inspired Halloween toys, decorations, and dolls. 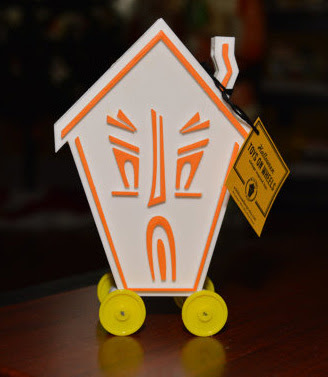 This is a unique Halloween Haunted House Vintage Toy. This is supposed to be a representation of vintage toys from the 1940's and 1950's. Another cool thing about it is that it is actually 3D printed and hand painted. This would be a really simple but cute decorative piece. 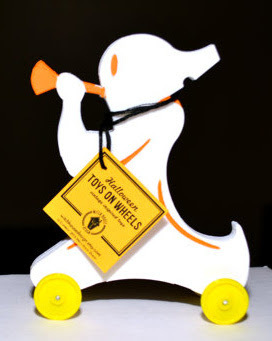 Out of all the toys, this Vintage Style Halloween Ghost Toy on Wheels is definitely my favorite. This is also 3D printed and hand painted like the latter. I think this is the most adorable. There is a possibility that I would keep him out all year. 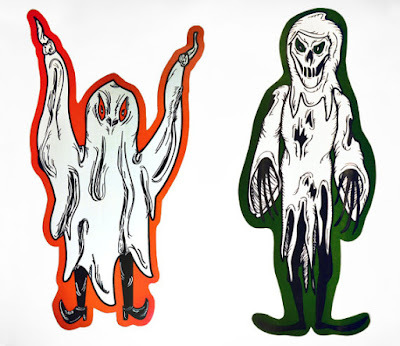 These spooky Halloween Ghosts Paper Cutout Decorations would be fun to have for this following year. Both of these measure around 13". 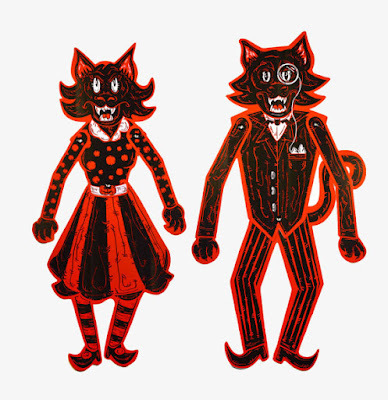 I think my house would be better suited to have the Halloween Jointed Cats Decoration on the walls. I have too many animals in my house and this would just fit my whole "animal farm" theme. This is a cute couple of cats that measure about 16 to 17 inches tall. I really love these cute dolls that Witch House Design makes. 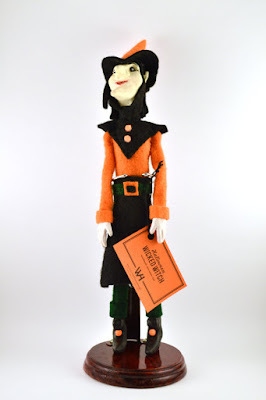 This cute little Halloween Wicked Witch Handmade Doll. 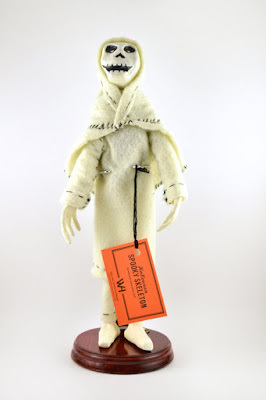 The witch doll is made out of felt and wire. This design reminds me so much of 1950 vintage Halloween posters. Another great doll, The Halloween Spooky Skeleton Doll would give any room a more eerie feel. I can't help but sing the Spooky Scary Skeleton's song when I see him! This fun doll is also made out of felt and wire and stands about 10". My favorite item in their whole store is Vintage Style Halloween Clown Plastic Candy Container. This would be awesome to use to give away candy! It would even be great as a center piece on a table. This would definitely be a hit during one of my Halloween parties! Look at more decorations and dolls by Witch House Design!